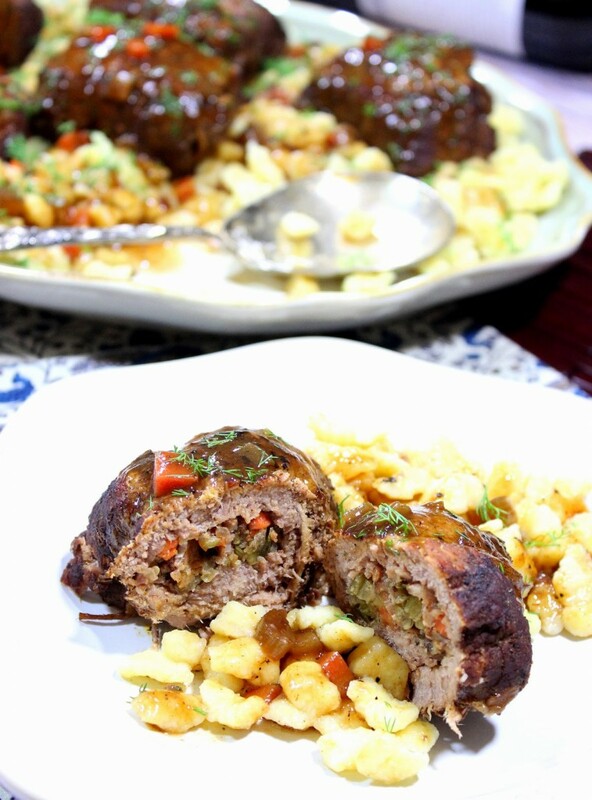 German Beef Rouladen is an eye of round steak that is pounded thin, then stuffed and rolled with a mixture of cooked bacon, carrots, celery, and dill pickles. They’re then browned for extra flavor and braised in a sauce of wine and beef broth until they’re fall-apart tender. This dinner of German Beef Rouladen is near and dear to my heart for so many reasons. If you’ve been a regular reader of my blog, then you know that several times I’ve written a little bit about my grandfather on my mother’s side that came over on the boat from war-torn Germany. His name was Hugo. Unfortunately, I don’t know a whole lot about my grandfather and the majority of what I do know I wouldn’t want to put in print on my blog. To say he was a complicated man is an understatement, and sadly I didn’t especially get to know my grandfather as I was growing up. During my childhood years, I knew my grandfather loved me, but it wasn’t something that was ever verbalized. Things like that just weren’t said. Not where he came from, and it certainly wasn’t in his realm of comfort. Sadly my grandfather died when I was entering my teenage years, so we never got to form any sort of real bond. 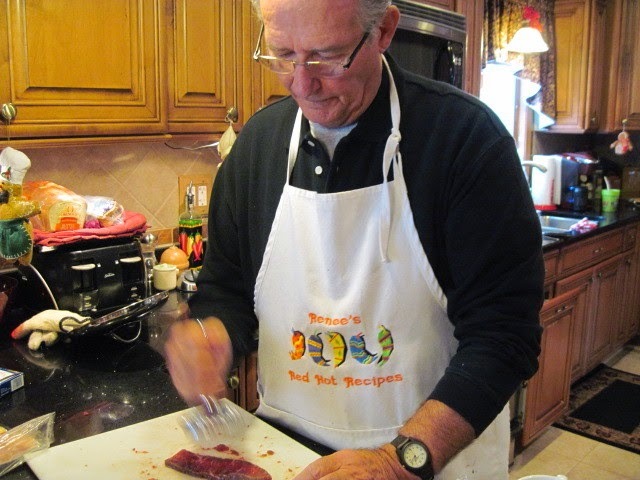 That said, what I do feel I share with my grandfather, and where the closeness in my heart attaches me to him, is in our shared love of cooking (by way of feel, and cooking with abandon). Also in our shared love of painting, which is something he was very good at, even though we unfortunately never got to discuss either of those two things. In large part, the unexplained desire that calls my name, and pulls at my heartstrings, making Germany the number one top spot on my bucket list that I want (make that need) to visit, is due to my grandfather. The undeniable connection I feel to Germany, and its cuisine is a realization that I simply cannot deny. Thankfully, because of food and recipes like this one, I can transport myself there at almost a moment’s notice, without ever having to leave home. With the help of my mom, Marlene (Hugo’s daughter) and my dad Bob; that we transported our entire family of 16 that one unforgettable Christmas Eve. Cooking together with my mom and dad in recreating that authentic German meal is what makes this one of my top five meals-with-memories, and one that I, and hopefully the rest of our family, will never forget! I paired Gallo Family Merlot with the rouladen. 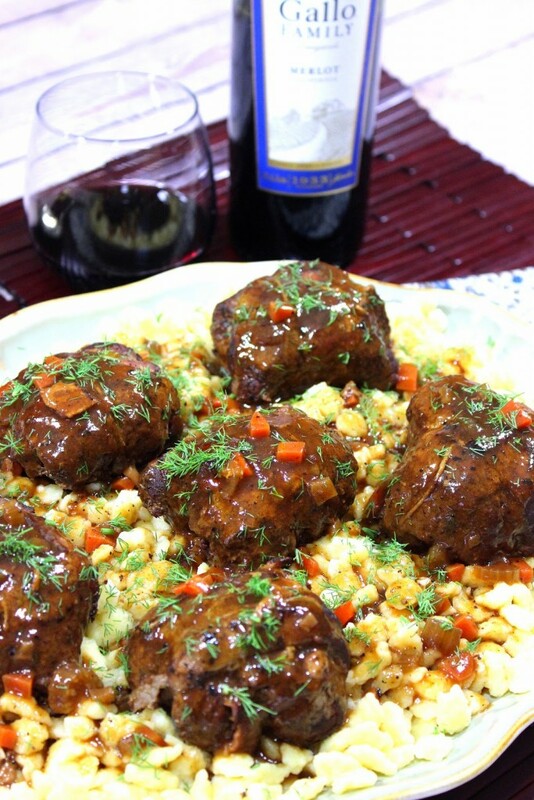 With its deep, rich, oak flavor, I knew it would stand up well to the bold taste of this dish and highlight the beef as well as the carrot, onion, bacon and pickle filling. -Place each round steak between 2 pieces of plastic wrap and use a meat mallet to pound the round steaks to ½” thickness. Season the steaks with 1 teaspoon salt, ½ teaspoon black pepper and the garlic powder. Set aside while preparing the filling. -In a large oven-proof skillet over medium/high heat, cook the bacon until almost crisp. Drain off some of the fat, reduce the heat to medium, and then add the carrots, celery, and onion to the pan and cook until the vegetables are almost tender (about 5 minutes). Stir in the pickles, dill weed. and season with the remaining ½ teaspoon salt and ½ teaspoon pepper. Remove the filling to a bowl and allow to cool slightly. Set the skillet aside for later. -Spoon approximately 2-3 tablespoons of the filling in the center of each pounded and seasoned steak. Roll the meat up and over the filling being careful to keep the filling inside the rolls. Tie each roll securely with cooking twine. *Note – you can also use toothpicks for this task but I find the twine works better for keeping the filling inside the rolls. Reserve any leftover filling you may have. -Heat the skillet to medium/high and brown the beef rolls well on all sides. Remove the browned beef rolls to a plate while you make the sauce. -Reduce the skillet heat to low, and stir in the Merlot wine to deglaze the pan by scraping up all the browned bit that have stuck to the bottom. Stir in the tomato paste and cook for 2 minutes. Carefully pour in the beef broth and any remaining carrot, onion, and bacon filling you may have leftover, along with the reserved ½ cup of diced carrots, and ¼ cup of diced celery. Nestle the browned beef rouladen back into the pan. Cover the oven-proof skillet and cook in a preheated oven for 2 hours. 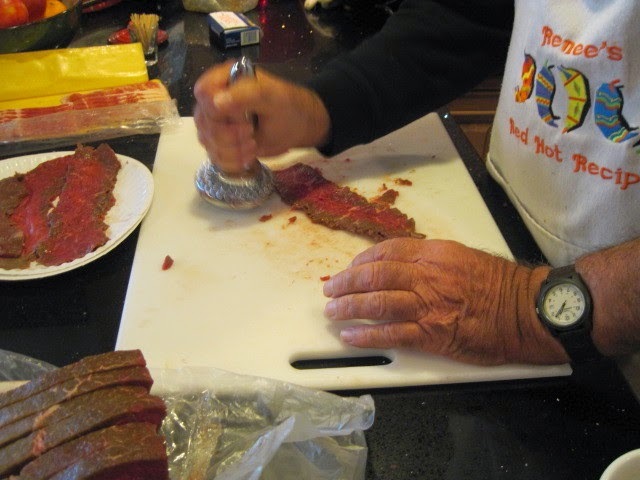 -Once fully cooked, remove the beef rouladen to a plate and cover to keep warm. Stir the cornstarch into 1 cup of water (making a slurry) and pour into the sauce in the skillet, Cook the sauce over medium heat until it thickens. 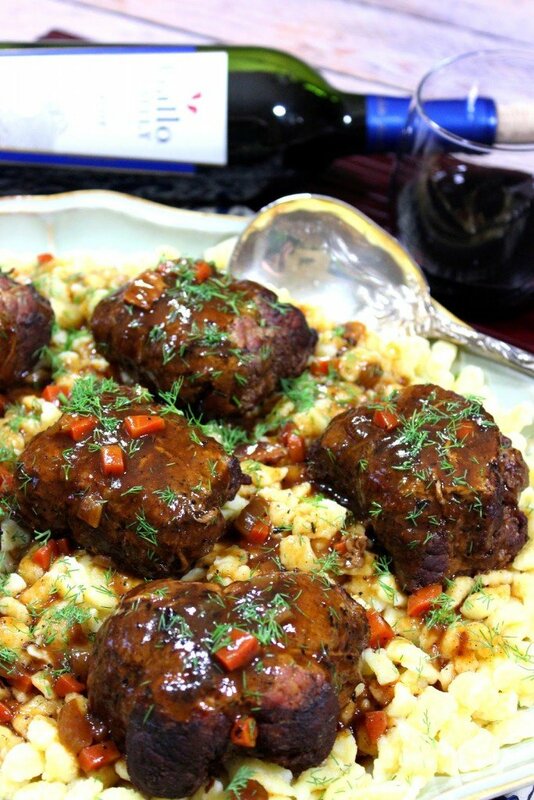 -Serve the beef rouladen over noodles or spaetzle and spoon the thickened sauce over top. Garnish with additional dill if desired. To learn more about Gallo Family Vineyard’s fine family of wines, please visit their wine blog . To find a store near you (which carries the variety you’re looking for), click here. Learn more about Gallo Family Vineyard’s Riesling, Sweet Red, Chardonnay, and Merlot wines. 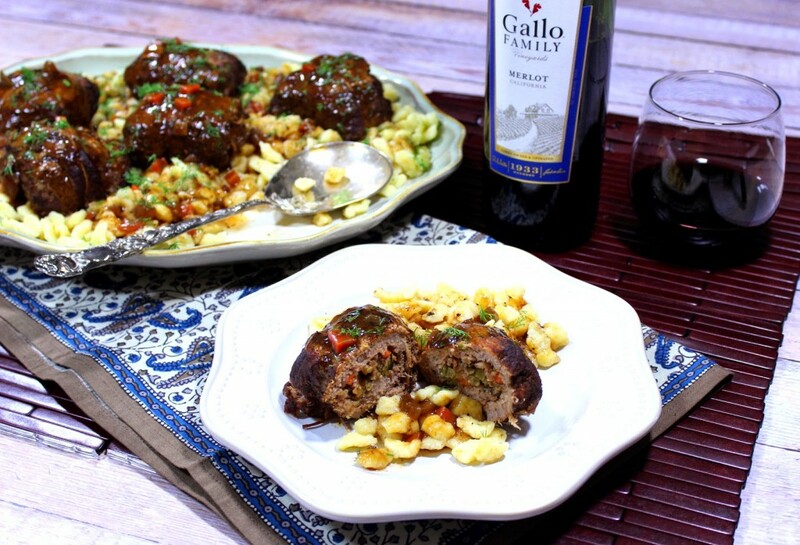 And while you’re at it, don’t forget to follow Gallo Family Vineyards on Facebook, Twitter, Instagram, YouTube, and our #SundaySupper Cooking with Wine Pinterest board. While you’re shopping for your Gallo Family wines, don’t forget to pick up a bottle of their Chardonnay. It’s one of my favorites to sip on with its citrus notes and hints of vanilla. It’s a real crowd pleaser. My most favorite meal ever!! Oh how I love, love, love Rouladen. I'm certain my meat and potatoes hubby would be thrilled with your rouladen for dinner! It sounds amazing!!! And such a fun, memorable Christmas Eve with your family. 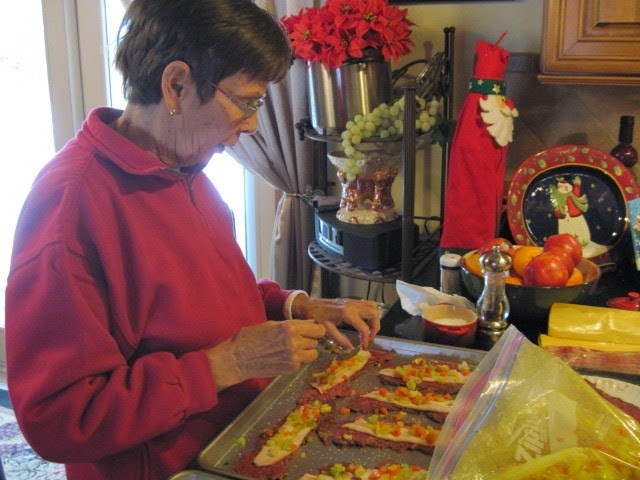 I didn't get to know my grandparents too too well either, but I often find myself making Italian dishes that my mom has inspired me to make after her Italian father and his mother shared those recipes with her. It's so crazy how food can tie people together in ALL ways. This dish looks so wonderful, Renee! What a great story and a special gift you gave to your family that Christmas 🙂 This dish sounds wonderful. I need to make it – possibly with my mother-in-law who is 100% German! Thanks for sharing, Renee! I have always wanted to make this but I am afraid the meat will be too tough. One day I will be brave and try it. What a wonderful memory and a wonderful dish! I love it! WOWZERS does this sound good! I have never had rouladen before, but you can darn sure know I will be trying it soon! That is a combination of flavors I would never expect, but it sounds amazing, and I love your memories – old and new! I love that you cooked this with your Mom and Dad! What a wonderful story of your Grandfather! I love this! It sounds delicious and is something that would surely impress my family! Even though you didn't get that extra time with your grandfather, it sounds as though he would have loved to cook with you in the kitchen. You're definitely keeping his memory alive with these beautiful rouladen. What a wonderful story about your grandfather and that is some seriously good looking comfort food. I love family recipes and the stories that go along with them! This looks wonderful and I love the addition of the pickles! I love the fact that you can "travel" to Germany through your food. 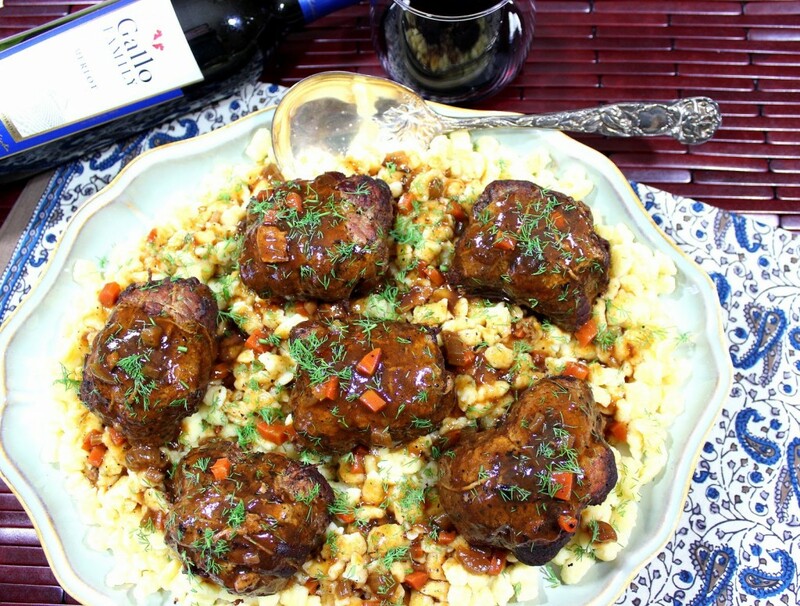 Best looking beef dish…maybe…EVER! I loved hearing this story about memories of your grandfather. My grandma and grandpa on my dad's side both passed when I was in still in high school, so I totally understand. Germany has always been on my must-visit list, as well due to my heritage. This rouladen looks excellent, and I love that the whole fam is involved in these shots! Thanks for sharing your story about your grandfather. I didn't know mine, either – he passed when I was still a toddler. Delicious recipe, though! This sounds like such an amazing meal to have! awww I loved reading about your grandpa! My grandpa was kinda like that too haha, not to big on the verbal love. 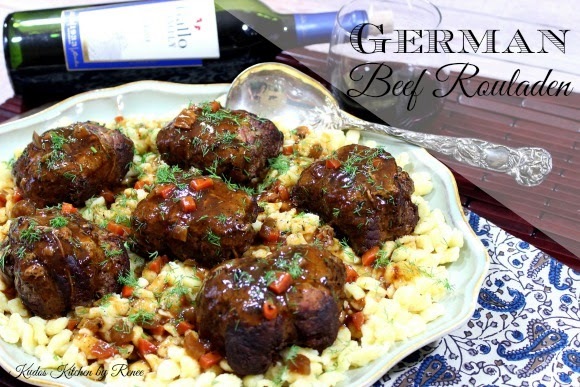 <3 Love this German Beef Rouladen! Looks like I need to make it one weekend! This looks absolutely wonderful. I want to run right into my kitchen to make it. I lost my mom and both her parents when I was a teenager, all within about a year. My mom's side of the family was so bubbly and I have tons of happy memories. Most of those memories are food related. I think food and cooking just connects people. This is such a lovely looking dish! It looks hearty, rich and perfect for these (still…sigh) cold winter days. This make my German heart sing!! I didn't know you had German grandparents. The war tore so many families apart… This recipe looks divine!! Nom nom nom. Lovely memory and beautiful dish. I have wonderful memories of my grandmother making pasta. I think that's how I got into cooking. Funny how our memories influence us. Renee, I really enjoyed this Rouladen, it reminded me a lot of my German in-law’s cooking. Thanks for sharing it. 2 questions: 1) where does the tomato paste come in? 2) I wasn’t sure what to do with the set aside bacon fat. Just use it in the last sauce thickening stage? My sincerest apologies for accidentally leaving the tomato paste out of the recipe instructions. I have since updated the recipe. The tomato paste gets stirred into the skillet right after the pan is deglazed with the wine, and before the beef stock. Thank you for catching my error. I wish I had an editor to proofread for me, but sadly I don’t and I sometimes make mistakes. I hope you have a wonderful day, and I’m glad you enjoyed this recipe!